Minos was king of Crete, and the first ruler to control the Mediterranean Sea, which he ridded of pirates. He had with him a famed craftsman, Daedalus the Athenian, who was in exile from Athens because he had murdered his nephew (and somewhat too talented apprentice), Talos. Daedalus enjoyed much favor at the court, but he managed to fall from grace by accommodating the queen, Pasiphaë, in a request. Minos had boasted that the gods would grant him any wish; he made all the preparations for a sacrifice to Poseidon, then prayed that a bull would emerge from the sea. Miraculously, a beautiful white bull swam ashore. Minos admired it so much that he decided to keep it, and sacrificed a different one from his herd instead. This unwise decision annoyed Poseidon, who avenged the insult by causing queen Pasiphaë to fall madly in love with the white bull. Her request to Daedalus was that he should help her consummate this passion. He did so by building an ingenious hollow wooden cow, covered with hide and with a door on top through which she could lower herself inside. Together, they wheeled it into the pasture where the bull was kept; Daedalus helped her get in, and then discreetly withdrew. 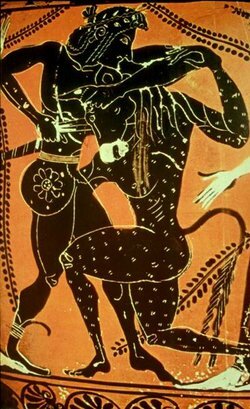 Pasiphaë was completely satisfied, but to everyone's horror, she then bore the Minotaur, a creature with a man's body but a bull's head. Minos, annoyed in turn, sent to the oracle at Delphi to discover how he could hide this evidence of the shame to the royal family. The oracle answered that he ought to have Daedalus build a suitable cage; Minos thereupon had Daedalus build the Labyrinth, an enormous maze, and placed the Minotaur at the center of it. Minos also arranged to sacrifice young men and women to the flesh-eating Minotaur by shutting them into the Labyrinth, where they would wander, hopelessly lost, until the Minotaur caught and devoured them. One of Minos's (fully human) sons by Pasiphaë was Androgeus, who visited Athens to compete in the All-Athenian games, where he won every contest. King Aegeus knew that Androgeus was in contact with his internal enemies, the sons of Pallas, and was afraid that he might persuade his father, Minos, to intervene on their behalf. Therefore, he laid an ambush for the young man with the help of the Megareans. After a fierce battle, in which he fought very bravely, Androgeus was killed. When Minos heard of the death of his son, he became enraged, and gathered a great fleet together to avenge the murder. Although he was the effective ruler of the Mediterranean, quite a few of the Greeks fought on the side of Athens, or stayed neutral. The refusal of Aeacus, the king of Aegina, to join the Cretans was particularly galling to Minos. With all of his power, though, Minos was unable to defeat the Greeks until, in exasperation, he called on the aid of Zeus to avenge Androgeus. Greece was hit by famine and earthquakes, and the oracle at Delphi advised the Athenians to satisfy any demands that Minos made in return for peace. The demand was for a tribute of seven youths and seven maidens to be given every nine years, as sacrifice to the Minotaur, to which the Athenians reluctantly agreed. Some time after this war, king Aegeus consulted with the oracle at Delphi on another problem: although he had been married twice, he had no children. She gave him a wineskin, and told him not to open it before he got home, or he would die one day of grief - an oracle which was difficult to interpret. On his way back to Athens, he spent a night enjoying the hospitality of his friend, king Pittheus of Troezen. Pittheus's daughter, Aethra, was betrothed to Bellerophon, but he had been banished to Caria in disgrace, and she had little hope of his return. Feeling pity for her enforced virginity, and somewhat influenced by the wineskin that Aegeus had imprudently opened, he sent his equally drunk friend to Aethra's bed; in the middle of the night, she was also visited by Poseidon. In the morning, when Aegeus awoke next to her, he told her that, if a son were born to her, she should raise him without divulging his paternity, in case the sons of Pallas should attempt to murder the boy as a blow to the royal house of Athens. When a son was duly born, Aethra named him Theseus and, although she was uncertain of his exact paternity, she raised him as she had been instructed. When he was old enough, she took him to a large rock, to see if he could lift it. He was able to do so, and underneath it he found a sword and a pair of sandals left there for him by Aegeus. He took these items, and set off for Athens. He decided to take the overland route, which was infested with bandits, rather than the safer sea passage, to prove himself. On the way, not too surprisingly, he met with many adventures, and had a suitable number of close calls. When he arrived, he was nearly poisoned by Medea, who had taken refuge with Aegeus after her various crimes in Corinth. She had had a son by Aegeus, and when she recognized who Theseus was, she convinced Aegeus to offer him a cup of wine laced with wolfsbane. He was just about to drink it when Aegeus noticed the sword that he carried, and intervened. There was great rejoicing in Athens, but Medea had to flee for her life, and Pallas and his sons were not happy. They began a rebellion, but were crushed by Aegeus's forces under the command of Theseus. However, the joy did not last. Minos's tribute came due, and as the ship approached, the seven youths and seven maidens had to prepare to leave. Theseus was so touched by the spectacle of grief that this preparation aroused that he volunteered to lead the group himself, promising the families of the others who would go with him that he would bring them all back alive. Naturally, Aegeus was not eager to allow his recently discovered son and heir to depart on so dangerous a task, but Theseus insisted, promising to hoist a white sail upon his return, rather than the usual black one, to signal his father that he was returning safely. The ship left for Crete with Theseus and thirteen other Athenians aboard - two of the "maidens" were actually feminine-looking young men who could pass for girls when they dressed the part. When they arrived in port, Minos himself came down to see them, and threw his signet ring into the harbor, challenging Theseus to prove that he was the son of Poseidon by retrieving it. This task Theseus accomplished, aided by dolphins and Neriads. As Theseus emerged from the water, Minos's daughter, Ariadne, who had accompanied her father to see the arrival of the ship, fell instantly in love with him. She determined to help him, and enlisted the aid of the ubiquitous Daedalus, who came up with the idea of using a ball of string to trace the way into, and back out of, the Minotaur's lair. Theseus kills the Minotaur as Ariadne looks on Armed with a sword supplied by Ariadne, Theseus entered the Labyrinth, worked his way to the very center, and found and killed the Minotaur. When he emerged, dripping with blood, Ariadne embraced him. The others had managed to escape from their prison - the youths disguised as women had killed the guards in the women's quarters - and they all met in a rendevous. They made their way to the harbor and stole the ship in which they had been brought to Crete, but the alarm was raised, and they had to fight their way out. As they made their way north towards Athens, they stopped at the island of Naxos. There, for reasons that remain obscure, Theseus left Ariadne behind - an act that is hard to describe as creditable to his reputation. She later became the bride of Dionysus, and bore him many children, but at first she was in a poor mood, and cursed Theseus. The curse was almost instantly fulfilled, for Theseus forgot to change his sail from black to white. As the ship pulled in to port, Aegeus, seeing the black sail, assumed the worst, and lept from a precipice to his death in the sea that still bears his name. Meanwhile, back in Crete, Minos finally discovered who had aided Pasiphaë in her debauchery, and for a brief time Daedalus and his son, Icarus, were imprisoned in the Labyrinth as well. However, Pasiphaë managed to get them released, and the father and son decided to leave Crete altogther. Since the harbors were watched, Daedalus fashioned artificial wings out of bird feathers; the larger ones were stitched, and the smaller held in place by wax. Before they took off, Daedalus warned his son not to fly too low, or the sea foam would wet the feathers and drag him down, nor to fly too high, or the sun would melt the wax, with much the same effect - "Follow me!" were his final words to the boy. They flew north, past Naxos, Delos, and Paros, and then Icarus got carried away with the delight of flying, and soared as high as he could go. The wax melted, and the boy tumbled into the sea and drowned close by the island of Icaria, which still bears his name. Daedalus continued on, making his way eventually to Camicus in Sicily, where he was welcomed by king Cocalus. Meantime, Minos determined to retrieve his master craftsman, and raised a fleet to find him. He needed to discover the whereabouts of the artisan, and he did so by proclaiming a huge prize everywhere he went for anyone who could draw a linen thread through the convolutions of a triton shell. Once the fleet was in Sicily, and he heard of the prize, Daedalus could not resist winning it. He did so by fastening a gossamer thread to an ant, and entering it into the shell through a hole that he had bored in the end, meantime smearing the open end of the shell with honey so that the ant would weave its way through to the source of the scent. He then tied the linen thread to the gossamer, and drew it through in turn. As soon as Minos knew that the the prize had been claimed, he knew where Daedalus was, and he made war on the Sicilians, defeating them. While he bathed in the palace at Camicus, though, the daughters of Cocalus, with the help of Daedalus, killed him by pouring boiling water on him through a cleverly fashioned vent above the tub. He joined his brother Rhadamanthys and his old enemy Aeacus in Hades, where they were made judges of the dead. Daedalus eventually moved on, and ended his days in Sardinia.